His mother was the sixth child of Jean Baptiste Lagimodière, a French Canadian coureur de bois and Marie-Anne Gaboury, the first white woman to settle in the Canadian west. Louis Sr. had been born at Île-à-la Crosse in 1817, the son of Jean-Baptiste Riel and Marguerite Boucher, a Franco-Chipewyan Métisse whom he married in 1789 “after the custom of the country”. In 1843, after spending his childhood in Québec where his parents had returned to live and following an attempt at being a seminarian, Louis Sr. went back to settle in the west, where he had been born. Bishop Tache sent him to Montreal in 1858, along with two other boys, Daniel McDougall and Louis Schmidt, to continue his studies. Setting out on June 1, 1858, in the company of the Reverend Sister Valade. They travelled for five weeks before eventually arriving in Montreal on July 5. In Montreal, Louis was admitted to the Collège de Montréal run by the Gentlemen of St. Sulpice, where he embarked upon an eight year classic course of studies, which included Latin, Greek, French, English, philosophy and the sciences. Louis proved himself to be an excellent student and was soon at the top of his class. However, in January 1864, he was overwhelmed with grief by the death of his beloved father whom he had not seen since leaving Red River. Although he continued his studies, his instructors found that his attitude had changed. They began to question whether Louis really had a religious vocation. In March, 1865, finding its regulation too restrictive, Riel left the Collège de Montréal. He requested and was granted permission to continue his schooling as a day student while living with the Grey Nuns. After breaking the rules several times and repeatedly missing class, he was asked to leave both the college and convent. ….Riel made his way to Chicago and St. Paul. It would appear that he lived for a while with the poet Louis Fréchette and a group of exiled French Canadian nationalists. It would also appear that he worked briefly for Edouard Langevin or Gilbert Lachance before returning to Manitoba. He arrived in St. Boniface (Manitoba) on July 26, 1868, after an absence of ten years, an educated but unemployed young man, with no idea that he would soon become the defender of Métis rights and the future father of Manitoba. At the time of his return to the Red River Settlement, Canada included only the provinces of Quebec, Ontario, Nova Scotia and New Brunswick. The territory known as Rupert’s Land, which extended west from Ontario all the way to the Rocky Mountains, belonged to the Hudson’s Bay Company (HBC). The company appointed a governor and council to administer the settlement situated at the junction of the Red and Assiniboine Rivers. 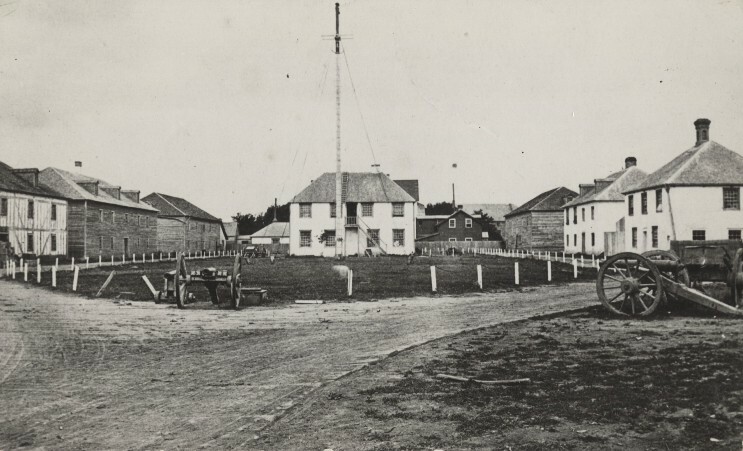 Fort Garry lay at the heart of the settlement, referred to as the District of Assiniboia, and was the headquarters of the Hudson’s Bay Company. During the 1850′s, the Métis had succeeded in breaking the fur trade monopoly that the company had held until then. The HBC had been forced to concede a political role in governing the settlement and certain property rights to the Métis. The years between 1850 and 1860 marked the end of the old way of life in the northwest. Before 1849, changes in the settlement had occurred because of internal events, but after 1850 they would be the result of external factors,centered around Canadian and American politics. The only remaining alternative was annexation of the Northwest Territories by Canada. In 1869, a unique opportunity presented itself, for the Hudson’s Bay Company agreed to sell this territory to Canada. It was at this point that Louis Riel returned to the settlement he had not seen for ten years. 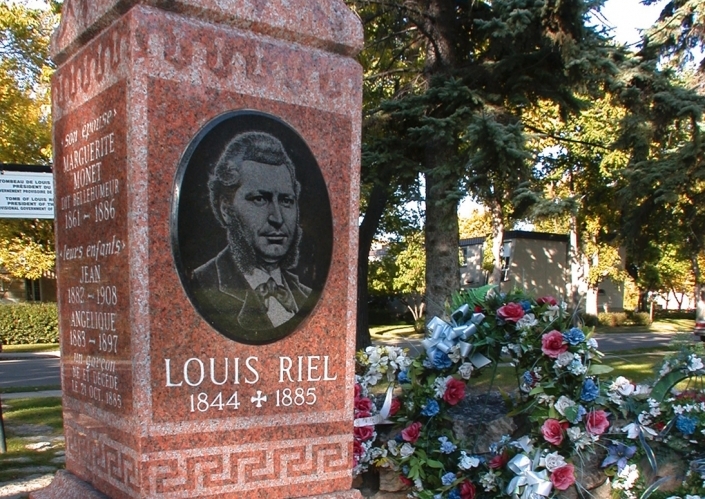 Many changes had taken place in the settlement since Louis Riel’s departure. With the arrival of numerous settlers from Ontario, Fort Garry had become an active commercial centre. For economic and political reasons, these Canadians were in favour of the annexation of Red River to Canada. However, the Métis felt resentful as they saw the area’s future being decided without them, in spite of their large numbers. Meanwhile the Canadians were opposed to the company’s authority, and the Métis were worried about the future under the Canadian Government. They were afraid the country would be invaded by people from Ontario and that this would create a problem for the Métis, because the newcomers would be English-speaking Protestants, not French-speaking Catholics. In addition to the problems of language and religion, they were justifiably afraid of losing their lands, for most of the Métis were squatters or settlers without title. During the summer of 1869, the Canadian Government sent John Stoughton Dennis to Red River to survey the land. He was so badly received by the Métis that he started surveying at Oak Point rather than Fort Garry. To add to the Métis anxiety, the survey was being carried out in accordance with the Ontario style of survey, in squares, instead of the system of long, narrow lots with river frontage used by the Métis. The new system cut across properties already in existence. Moreover, surveying had begun before the land had been officially transferred to Canada. 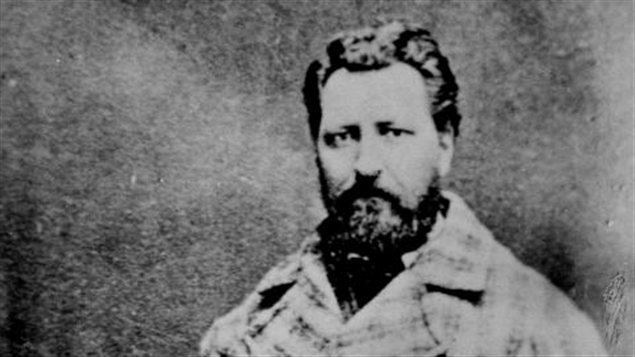 When Dennis arrived in Fort Garry on October 11, 1869, eighteen Métis led by Louis Riel stopped a crew of surveyors on the property of Louis’ cousin, Andre Nault, and proclaimed that the Canadian Government had no right to act without permission. This was a very important incident, because it was the first act of resistance to the transfer of the settlement to Canada and, because it established Louis Riel as the champion of the Métis. 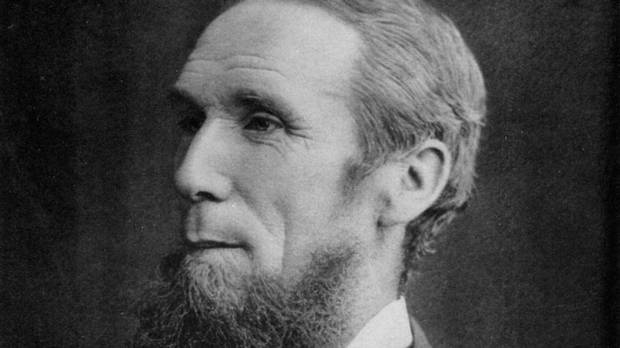 In October, William McDougall, who had been appointed Lieutenant-Governor of Rupert’s Land, set out for Red River to take possession of the Northwest Territory for Canada, accompanied by a ready-made government and armed with 300 rifles. When news of this reached the Métis, they decided to organize their resistance. On October 16, Riel was elected Secretary of the Métis “National Committee” and John Bruce was elected president. Five days later, the Committee sent a warning to McDougall advising him not to enter the country without special permission from the Committee. To strengthen their position, the Métis erected a barricade where the trail from Pembina crossed the La Salle River, a place McDougall had to pass. Riel’s initiative raised opposition from the conservative wing in the settlement and those in administrative positions. As a result of pressure exerted by them Riel was summoned to appear before the Council of Assiniboia, chaired by Judge Black who was replacing the ailing outgoing Governor Mactavish. Riel let it be known that he was opposed to McDougall’s arrival and invited the English group to join him. He stressed that he remained faithful to the British Crown but that he objected to the unlawful entry into the west of the Canadian Government. He believed that the west should have the right to negotiate its own terms of entry into Confederation. On October 30, McDougall, Cameron and Joseph-Alfred Norbert Provencher, the nephew of Bishop Provencher, arrived in Pembina where they read the Committee’s note. However, they refused to heed this warning, and the next day, Cameron and Provencher proceeded to St. Norbert where they were stopped and conducted back to the American border escorted by 30 Métis. On November 2, McDougall met with the same fate. Riel and the Métis thus succeeded in cutting McDougall off from the group in Winnipeg who favoured Canadian annexation. The same day, the Métis took possession of Fort Garry, thereby establishing their control over the surrounding area. However, their power was precarious because they were only assured of the support of the French Catholic population. Riel was aware that he would need the backing of all elements in the settlement to negotiate with the Canadian Government. A series of meetings was held to endeavour to foster this support, but without the hoped-for success. Several people objected to the way McDougall had been treated. However, agreement was reached on the preparation of a list of rights. On November 23, Riel proposed the formation of a provisional government to replace the Council of Assiniboia. This surprised the English-speaking half breeds who asked for a few days adjournment for consultation, not believing that their mandate empowered them to make such a decision. The official transfer of the land to Canada had been set for December 1, 1869. During this period, Sir John A. Macdonald postponed payment to the company because of the disturbances in the settlement. On December 1, McDougall , who had not been notified, read the proclamation announcing the transfer of the company’s territories to Canada. From that moment, Riel’s Provisional Government became legitimate, for the company lost all authority on December 1 and Canada acquired none because it had not paid anything. and, Donald Smith, the Hudson’s Bay Company representative in Canada and a government agent, arrived in the settlement. A meeting which began on January 19, 1870 attracted upwards of 1,000 people. During the meetings on January 19 and 20, Smith made it known that his government had good intentions with respect to the people of the Red River Settlement. In order to find a way of negotiating their rights with Ottawa, Riel proposed that another convention of 20 French-speaking and 20 English-speaking representatives be called to draw up a new list of rights. The Convention began one week later and the work was completed by February 10. With unanimous agreement, Riel formed another provisional government which was more representative than the previous one. Three delegates were elected to present the List of Rights to the Canadian Government: Father Noel Ritchot, Judge Black and Alfred Scott. Everything seemed to indicate a return to a state of calm, but such was not to be the case. Even while the delegates were still sitting, a group of Canadians was preparing a counter-Riel movement. 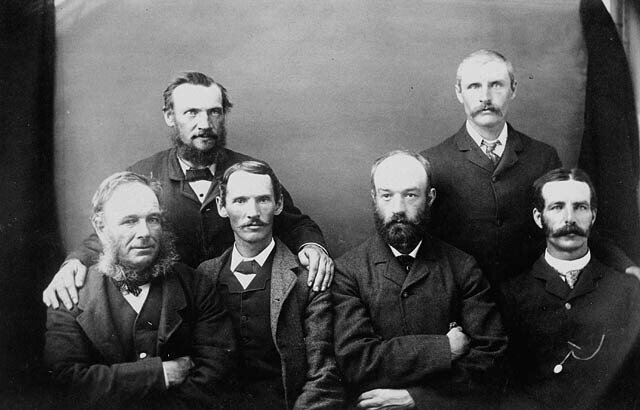 These men had supported John Schultz and J. S. Dennis in opposing Riel’s Provisional Government in December 1869. Several of them had been imprisoned at Fort Garry, but a substantial group was still at large in the vicinity of Portage la Prairie. 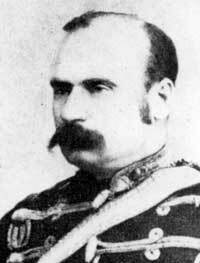 On January 9, 1870, nine prisoners escaped from Fort Garry, and on January 23, John Schultz led an attack on the fort. On February 12, Major Charles Boulton and his men, passing near the fort, were arrested by Riel’s men; 48 were captured, including Thomas Scott. Major Boulton was tried and sentenced to death, but the sentence was never carried out. After causing problems and attempting to escape, Thomas Scott was summoned to appear before a Métis court martial formed in accordance with the custom of the buffalo hunt and presided over by Ambroise Lepine, Louis Riel?s lieutenant. The seven members of the court found Scott guilty of defying the authority of the Provisional Government; of fighting with the guards; and, insulting the president. He was sentenced to death by a vote of five to two and the next day, March 4, 1870, he was executed by a firing squad. Although pressure was brought to bear on Riel to prevent the execution, he refused to be swayed. We can only wonder what motives prompted Riel to allow Scott’s execution. Was it an act of vengeance against Scott or fear of losing the respect of the Métis? Scott was an Orangeman who was fiercely anti-Catholic and Riel perhaps believed he would make an example of him. Whatever the real motive, this action excited much controversy. It forced Riel into exile and shook even his most ardent supporters. 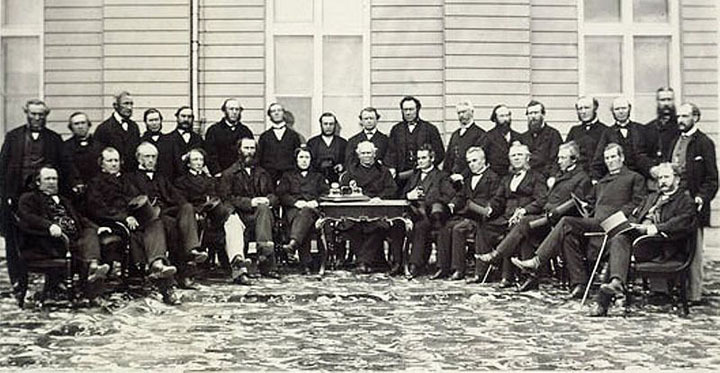 On March 24, the three delegates left for Ottawa to negotiate the terms of entry into Confederation with the representatives of the Canadian Government. Father Ritchot became the real spokesman for the delegation, as Judge Black and Alfred Scott showed themselves to be relatively ineffective. After relentless questioning and arguing, he was able to convince the government to introduce the Manitoba Bill into the House of Commons. On May 12, 1870, the Manitoba Act, based on the Métis List of Rights, was passed by the Canadian Parliament. One section protected Métis lands and guaranteed their right to religion and to the use of their language in the legislature and the courts. Riel, as head of the Provisional Government, was to maintain peace and order while awaiting the arrival of the first lieutenant-governor, Adams G. Archibald, and Colonel Wolseley’s troops, which were accompanying him. Wolseley’s troops arrived before Archibald, and although they were supposed to restore order and keep the peace, a number of the soldiers wanted to seek out Riel and avenge the death of Scott. Warned of their intentions, Riel, Lepine and William O’Donoghue, an Irish American, had time to flee to sanctuary in the United States. Riel went to the Métis settlement of St. Joseph, in the Dakota Territory, to await news from Red River. A letter arrived shortly thereafter from Bishop Tache which suggested that he remain in hiding, for his life would be in danger if he returned. The situation was serious; disputes between the Métis and Wolseley’s men were growing in number. Riel found it difficult to remain far away in hiding, and on September 17, he returned to attend a gathering of the Métis in St. Norbert. At this meeting, it was resolved that a petition be sent to the President of the United States, Ulysses S. Grant, to ask him to intercede with the queen for an investigation of their demand for amnesty. O’Donoghue wanted annexation of the settlement to the United States, but Riel opposed the idea. However, O’Donoghue was selected to carry the petition to the president. On the way, O’Donoghue went to New York where he met with some Irish Fenians who had already made forays into Canada. He managed to convince them to make a raid into Manitoba. When news of this reached Manitoba, Lieutenant-Governor Archibald was very concerned. Would the Métis join in the raid? At this moment Louis Riel intervened. Believing that the Métis future lay with Canada, not with the United States, he assured the lieutenant-governor that the Métis would not join the Fenians and he kept his word. 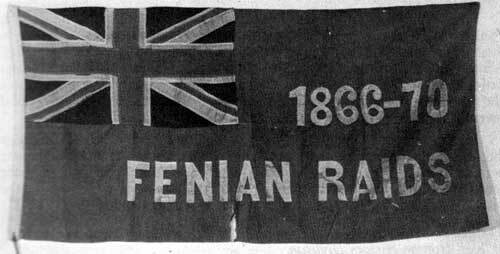 For want of local support, the Fenian attack died before it had begun. Grateful for the assistance that Riel provided, Archibald was prepared to leave him in peace. However, this feeling was not shared by all and Archibald came to believe that peace would be restored more quickly if Riel left the country for a while. Riel and Lepine were offered $1,000. 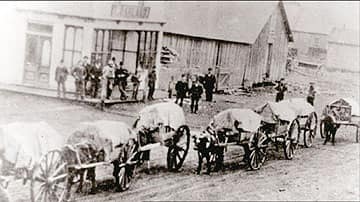 They reluctantly accepted; left Manitoba on February 23, 1872 and travelled to St. Joseph, bound for St. Paul, Minnesota. Bounty hunters pursued them constantly. Nevertheless, Riel and Lepine were soon homesick. Lepine was the first to return to Red River in May 1872. The following month, Riel made his way to St. Joseph where he began to campaign as a candidate in the federal election for the Manitoba constituency of Provencher. …although Louis was subsequently elected by acclamation, the House would not allow him to take his seat. Frustrated, he returned to the United States where he was plagued by illness. In May 1874, he tried for a second time to take his seat, but once again had to flee. This time he had succeeded in signing the member’s register. He returned to St. Paul and then to Keeseville, New York where he lived with Father Fabien Barnabe. 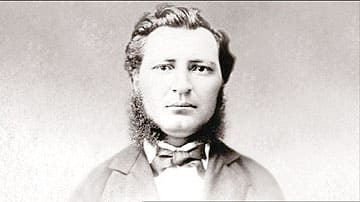 In 1877, the new Prime Minster, Alexander Mackenzie, granted Riel amnesty for the trouble in 1869-1870 on condition that he not return to Canada for five years. Exile was a time of anguish for Louis. He was often depressed and claimed that he had visions of a mission to fulfill. His cries and lamentations so frightened Father Barnabe that he sent for Riel’s uncle, John Lee, who took him back to Montreal where he was confined to an asylum in the Province of Quebec, under the name of Louis R. David. Shortly thereafter, he was transferred to the asylum at Beauport where he gradually recovered his health. He was discharged from the asylum in January 1878, with the recommendation that he avoid excitement. From Beauport, Riel returned to Keeseville where he remained for a while. During this time, he fell in love with Evelina Barnabe, Father Barnabe’s sister. Less interested in politics now, Riel tried to find work so that he might have something to offer Evelina. Finally, he decided to return to the west. Evelina did not think she would be able to adapt to prairie life and after several months, Riel stopped writing to her and the relationship came to an end. In the fall of 1878, Riel returned once again to St. Joseph, near Pembina where he was visited by his mother and his friends. Life in Manitoba had changed a great deal. The influx of immigrants was driving the Métis away. 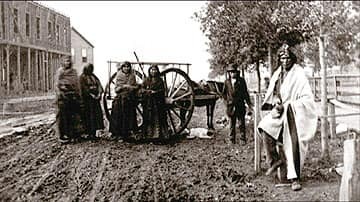 Stripped of their land and their way of life, they were moving farther and farther west to settle along the Saskatchewan River at places such as Lac La Biche, Qu’Appelle, Edmonton, Prince Albert, Duck Lake and Batoche. While these changes were taking place, Riel was living in the United States, for he was still banished from Manitoba. Since 1879, he had followed the buffalo hunt and worked as an agent, trader and woodcutter near Carroll, in the Montana Territory. Here he met Marguerite Monet Bellehumeur, a Métisse whom he married on March 6, 1882. Riel began to take an interest in American politics and became an American citizen. When his term of exile ended, he paid a brief visit to his mother, then returned to live in the United States where he became a schoolmaster in order to provide for his family which now included two children. Although he was a good teacher, Louis was not happy. He had hoped to instruct the Métis but found that they made little progress, coming to class only sporadically and preferring to follow the hunt. On June 4, as mass was ending in Swan River County, Riel received a visit from four Métis, Gabriel Dumont, Moïse Ouellette, Michel Dumas, and James Isbister, who had come to ask Louis to lead the Métis once again. now again threatened by the influx of settlers and immigrants. Their borders were again disappearing; their rights were no longer being respected; their lands were being taken; and, the government was not listening. Louis made up his mind quickly. The dream he had cherished for so long was coming true: his people needed him. After an absence of 15 years, he returned to Canada. These years had strongly marked him, exiled from his native land and pursued by bounty hunters, he had suffered a nervous breakdown. Now he saw the opportunity to reclaim his rights and those of his brethren from the Canadian Government. Louis set out for Batoche with his wife and two children, arriving there around the beginning of July 1884. On July 8, he addressed the Métis. His program was a moderate one, directed as much toward the Indians and the white setters as the Métis. All three groups responded warmly to his presence. Each group was to retain its independence, but a central committee was to be set up to formulate specific demands to be sent to Ottawa. A decision had been made to send petitions to Ottawa on behalf of the people, in the hope that the government would listen. Several of Riel’s supporters would have preferred bolder action. The Indian and the Métis were dying of hunger and the European settlers were anxious to have the land issue resolved. On December 16, 1884, after several public meetings, a petition was dispatched to Ottawa demanding that the settlers be given title to the land they occupied; that the districts of Saskatchewan, Assiniboia and Alberta be granted provincial status; that laws be passed to encourage the nomadic Indians and Métis to settle on the land; and, that the Indians be better treated. In spite of the support Riel received from the Métis, anti-Riel feeling prevailed among the Catholic clergy who feared his power and were suspicious of his religious beliefs. Their opposition caused the breach between Riel and his church to grow even wider. Led by Father Andre, the clergy tried to oust Riel as Métis leader, but were unsuccessful. On February 11, 1885, the federal government answered the petition that had been sent on December 16 of the previous year, and promised to appoint a commission to investigate the Métis claims and titles. Riel asked the Métis if they wanted him to continue as their leader. Forsaken by their priests, the Métis reaffirmed their vision of Riel as leader and prophet. Over the winter of 1885, tension began to mount among the Indian tribes as they fell victims to hunger and disease and the Indian agents did not have the resources necessary to relieve their suffering. The Indians then realized that their situation was similar to that of the Métis and they too turned to Riel. On March 19, the Feast of St. Joseph, Riel established a provisional government and took possession of the local church as his headquarters. Pierre Parenteau was chosen the first president and Gabriel Dumont was chosen adjutant-general. However, following the formation of the provisional government Riel became aware that his authority was weakening; the church was hostile because the clergy played no role in the new nation and the English-speaking Métis and settlers refused to take up arms. Riel found himself again supported only by the French-speaking Métis and the Indians. He decided to capture Fort Carlton which he considered essential to his operations. He wanted to occupy it without violence, but the mounted police reinforced its garrison. Thus, Riel could only negotiate or attack. Opting for negotiation, Riel sent Charles Nolin and Ambroise Lepine to demand that Major Crozier surrender the fort to him. In return he would let Crozier and his men go free. There was no time to conclude the negotiations because fighting broke out at Duck Lake on March 26. Major Crozier had left Fort Carlton with 56 mounted policemen and 41 civilian volunteers to stop Riel. Led by Gabriel Dumont, the Métis met them at Duck Lake. Dumont succeeded in drawing the troops into a valley where Crozier was forced to come to a halt. Two horsemen, Isidore Dumont and Falling Sand, a Cree Chief, came forward to meet them. Believing they wished to parley, Crozier advanced, accompanied by a guide named McKay. All four men stopped in the middle of the valley and Crozier extended his hand as a gesture of friendship. Thinking they had been betrayed, Falling Sand made a grab for McKay’s rifle. The guide fired and Isidore Dumont fell dead from his horse. The battle of Duck Lake had begun, after 40 minutes, with his force decimated, Crozier gave the order to retreat. Ten members of the government force had been killed and 13 wounded in the battle. Further casualties were avoided when Riel intervened to prevent Dumont from pursuing and killing all the retreating soldiers. This battle made the Indians and Métis realize that the Canadians were not invincible. Soon war whoops and cries of revenge rang out among the Indian tribes. Two hundred Cree attacked Battleford and Fort Pitt, killing six. At Frog Lake, Wandering Spirit and his followers murdered the Indian Agent, Thomas Quinn, and two priests, Father Fafard and Father Marchand. The Frog Lake incident prompted the Canadian Government to intervene. Up until this time, John A. Macdonald had not taken events in the west seriously, but the Frog Lake massacre quickly caught his attention. The government responded by increasing the amount of money given to the Indians for food, (this was a wise decision because with their hunger satisfied, some of the Indians remained on the reserves) and by mobilizing a military force of 8,000 men under the command of Major General Middleton. Thanks to the newly-built railroad, the troops were in Winnipeg 10 days after the Battle of Duck Lake. Three columns of troops were then dispatched to the centres of disturbance in Saskatchewan. Gabriel Dumont and 350 Métis intended to defend Batoche. Dumont believed that the only effective way of accomplishing this was through Indian warfare-surprise attacks followed by hasty retreats. Riel was opposed to this plan. He wanted to avoid violence as long as possible, in hope of carrying negotiations through to a successful conclusion. …a messenger brought word to them that a mounted police detachment was approaching Batoche from the direction of Qu’Appelle. Dumont sent 50 men back to defend the settlement, under Riel’s leadership. 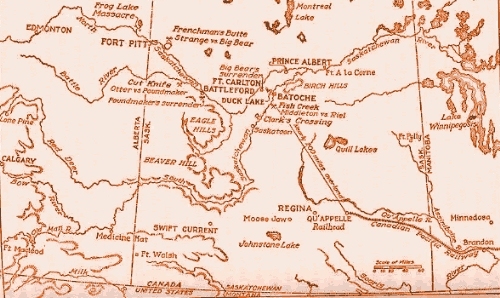 With Dumont in command, the battle of Fish Creek ended in a stalemate which the Métis regarded as a victory because they had succeeded in checking the Canadians’ advance. Meanwhile, in Batoche, Riel was beginning to have doubts about the decisions he had made. Reports indicated that troops had arrived in the vicinity of Batoche. In despair, he appealed to Poundmaker and Big Bear for help, but they could not arrive in time. 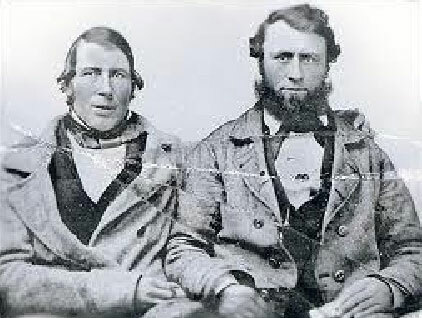 Cautious after Fish Creek, Middleton stopped for two weeks to rest his men. He left Batoche on May 7, accompanied by the steamer Northcote in the Saskatchewan River. The Métis soon managed to disable the steamer, but the government troops were too strong. On May 11, the fourth day of the battle, the Métis were defeated. The two leaders reacted differently to this defeat. Both were hidden in the woods and ravines around Batoche. Riel, after ensuring the safety of his family, withdrew into the woods to pray. He made no attempt to flee. When Middleton demanded that he surrender, he replied that he would give himself up to fulfill God’s will and that he wanted freedom for all his council and his people. He would surrender so that he could continue to defend the Métis cause. After his surrender, Riel was taken to Regina. Dumont, on the other hand, tried unsuccessfully to recapture Batoche. Then, hearing that Riel had given himself up, he fled to the United States with Michel Dumas and Ambroise Lepine. The rebellion was over. Poundmaker surrendered on May 23, but Big Bear was still at large. He was attempting to restore the unity which had existed on the plains. On May 26, he engaged Colonel Strange’s men in battle, but, with his braves dying of hunger and no ammunition left, Big Bear finally gave himself up. Riel was charged with high treason. The trial opened on July 20, with Riel pleading not guilty. This trial was to have disastrous consequences for Riel and for Canada. The jury was entirely Anglo-Saxon and Protestant. Riel’s lawyer wanted to plead that Riel was insane and not responsible for his acts. Riel was so opposed to this strategy that his lawyers had the judge rule that he did not have permission to speak. The lawyers were not allowed to speak of the grievances which had led to the rebellion, as the judge declared that it was Riel, not the Government of Canada, who was on trial. The witnesses’ testimonies were damning. They insisted that Riel had been mentally unstable before and during the rebellion. 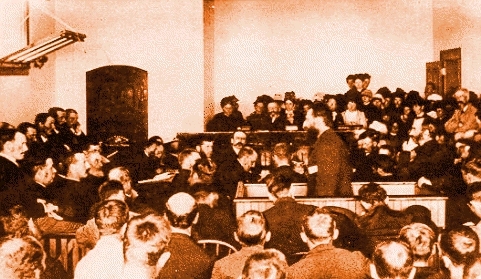 Towards the end of the trial, Riel was allowed to speak. After a moment of prayer, he reviewed the troubles in the northwest. Beginning with the sufferings his people had endured and the government’s inactivity. He maintained with dignity that he was not insane and that he did not want to be acquitted by reason of insanity. He did not deny that he had previously been committed to a mental hospital, but pointed out that the doctors had certified that he was cured. Did visions, prophecies and missions signify insanity? He closed with a few eloquent comments on the sacrifices he had make and asked for justice. Riel was sentenced to hang on September 18. Then a series of appeals began. The first was to the Manitoba court of Queens’ Bench which affirmed the original sentence on September 2. The appeal succeeded, however, in having the execution postponed until October 16. A second appeal to the Judicial Committee of the Privy Council was dismissed and the execution was set for November 10. Macdonald, uncertain what decision to make, yielded to pressure from Ontario and Quebec and granted a third reprieve to enable a medical commission to examine Riel. When the commission was unable to pronounce him insane, the date of execution was set for November 16. While awaiting death, Riel received a visit from his family and on November 6, he wrote his will. During the night of the 15th and the early hours of the 16th, he wrote one last letter to his mother and received last rites. At 8:00 a.m., he climbed the stairs to the scaffold for his execution. On November 19, a service was sung for the repose of his soul at St. Mary’s Church in Regina. On December 9, his body was returned to St. Vital where it lay in state for two days in his mothers house. A requiem mass was sung December 12 at St. Boniface Cathedral and his body buried in the churchyard. Thus lived and died a man whom we acknowledge today as the founder of the Province of Manitoba and a defender of the rights of the Métis and French Canadians. Neering, Rosemary, Louis Riel. 1977. (Series: “The Canadians”). Rielpolitik, I commend you for taking up the cause of Louis ‘David’ Riel. I have been working for the exoneration of Louis Riel since 1985, Now, with the election coming it is time to finally – after 130 years – recognize Louis Riel’s “Proper place in Canadian History” as called for by the Canadian Government in 1997. The NDP has stated their support for the exoneration of Louis Riel. However the defeat of the present government is necessary to make this happen as this prime minister, following in the footsteps of his hero John A, has no intention of recognizing Riel and reconciliation with the Metis I note that you have used my Voice of the People in your presentation. Please support the call for the Parliamentary Exoneration of Louis Riel so that the stain of ‘Traitor’ is removed from Riel’s good name and he is recognized as Canada’s “Aboriginal Father of Confederation” for Canada’s Sesquicentennial – July 1, 2017. Gabriel Dumont was the real genius of this rebellion. Riel refused to listen to Dumont, who decided it was not worth it to die with him. If Riel had listened to Dumont, there would be a country. Riel tried to fight the English like a ‘gentleman’. Dumont knew the nature of the English, and tried to fight them in a way they deserved. Riel was a fool. Dumont is the person to be honored.